Anker -Expand and accelerate your data transfer and charging. Featuring an extremely compact size and lightweight design, the 7-Port Hub docks your various devices without occupying extra space. What’s more, the upward-facing ports let you plug in devices one-handed. Solve your everyday connection inconvenience, so you can stay focussed on more important things. Don’t deny your devices access to SuperSpeed ports. With transfer rates of up to 5Gbps, set aside less time for syncing and more time for work. With 7 data terminals to choose from, forget about ever having to switch or unplug again. 7th-port dual functionality enables fast charges of up to 1.5 amps with BC 1.2 charging-compliant devices, while simultaneously transferring data. 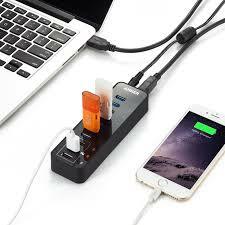 Charge via a power adapter for higher 2 amp speeds with all USB-enabled devices when hub is disconnected from an active USB port, or your computer is off or in sleep mode. Dual functions, duly facilitated.